Play your way through this luxurious slots online game and win yourself some of the largest diamonds known to man. 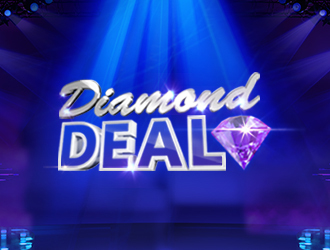 Diamond deal is an online slot game like no other in a way that there are no reals or paylines. Enjoy the gameshow aesthetic of this crystalline game and experience this luxurious minesweeper style game on that 5x10 game board. Mine the golden diamond and you could be earning some huge rewards. Join and spin the wheel today! Microgaming are a leading supplier of global online gaming software, based in the Isle of Man. They created the first true online casino back in 1994, and have worked hard to keep the same standards throughout their careers. Having created over 850 unique casino games, and over 1,200 variants including licensed or original content. If you like slots promotions, click here to play today! 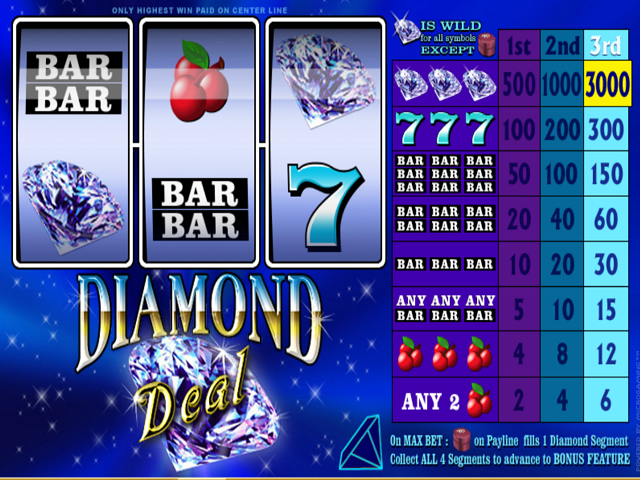 Diamond Deal is a 3 reel, 2 row online video slots game centred on the one gem that is every girl's best friend. With an absolutely phenomenal looking UI, the game really tries to live up to its name. The games background is a mixture of blues with sparkling white glitter spread across it. The reels themselves are a pale blue, surrounded by black and white. To the right of the reels is a display explaining the payout of each symbol, and the wild and scatters. The wild symbol in the game is, of course, the diamond. This symbol can replace any and all other symbols in the game excluding the scatter. When they player lands one of these, they will receive 500 coins. When they land 2 of these, they will receive 1000 coins. If the player manages to land 3 of these, they will receive a huge amount of 3000 coins. The game's Scatter Symbol is a Jewel box with “DD” inscribed on the lid. This symbol is only available when the player bets 3 coins of any value. The scatter symbol contains a diamond segmen and when the player collects all four diamond segments, they will activate the Diamond Deal Bonus Game. Check out our full new uk slot games. In the Diamond Deal Bonus Game, the player must choose from Five Jewel Boxes to reveal random bonus win amounts. There is no specific payout for any Jewel Box combinations, and you do not lose your diamond segments that you have collected when you finish the game. Playing the game in Expert Mode allows the player to access more customizability for their spins. The player will be able to use the autoplay feature, choosing the number of spins to play along with the conditions for the autoplay feature to stop. The player can set it so that the game stops when their balance decreases by a certain amount, or beyond a certain point and can choose to stop their game if their winnings exceeds or equals a certain amount. Read more about casino by mobile and claim your free spins today at https://www.easyslots.com. All in all, Diamond Deal is a fairly basic game with only 3 reels with 2 rows. The game has an RTP (Return to Player) of 96.12%, which is fairly average for a five reel, 3 row slots game. The fact that a game with so little room to win has such a high RTP surprised me quite a bit. I would recommend this game for beginners as it is very simple, and doesn’t pose much of a risk for players to lose. More experienced players may get a little bored after a while due to the game's repetitiveness and lack of excitement. Now check out our Piggy Riches, visit the site now and start spinning!